Mr Pistorius says he mistakenly shot his girlfriend Reeva Steenkamp through the door, believing she was a burglar, then broke it down with the bat. The prosecution says he tried to beat down the door and then fired the gun. Mr Pistorius denies intentionally killing Ms Steenkamp in February 2013. Forensic expert Police Colonel Johan Vermeulen also said he thought Mr Pistorius had hit the door with the bat from a low angle, indicating he was not wearing his prosthetic legs at the time. This contradicts the athlete's claim that he had been wearing his artificial limbs. Correspondents say whether or not the athlete was on his prosthetic limbs is important because it could match parts of his story that he accidentally shot Ms Steenkamp, or expose inconsistencies in it. Cross-examining, Mr Pistorius' defence team asked forensic expert Col Vermeulen to kneel and lift his feet, which caused him to wobble. The defence team claimed that Mr Pistorius therefore would not have been able to balance on his stumps and break down the door using a cricket bat. Defence lawyer Barry Roux also alleged that police had contaminated the crime scene by stepping on the door. 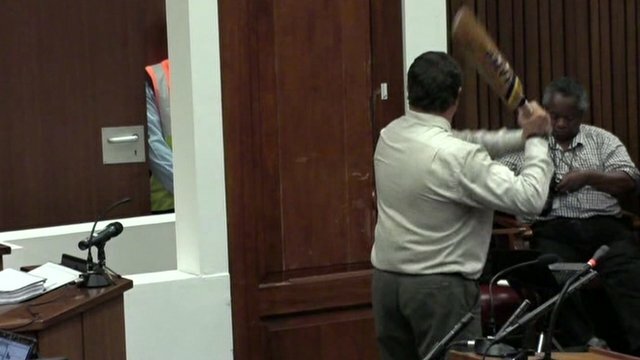 Col Vermeulen argued that if Mr Pistorius was balanced enough to fire a gun, he could also break down a door with a bat. The defence team argued that a mark on the bottom of the door showed where Mr Pistorius had tried to kick open the door using his prosthetic legs. Col Vermeulen agreed that this was possible. "The marks on the door are actually consistent with him not having his legs on and I suspect they must be similar to the height that he was when he fired the shots," he told the court. The prosecution argues that Mr Pistorius hit the door with the cricket bat before the shots were fired, but the defence claims it was the other way round. Earlier on Wednesday, a friend of Mr Pistorius claimed that the star had driven at 200 km/h (124mph) and that he had taken a picture of the speedometer to prove it. The defence team alleged that Darren Fresco was himself driving at the time and had therefore fabricated evidence. On Tuesday, Mr Pistorius' defence team questioned a pathologist's finding that his girlfriend had eaten less than two hours before he killed her. This contradicts the athlete's account that the pair had been in bed for several hours before the shooting. The state is seeking to convince the court that Mr Pistorius and Ms Steenkamp, a 29-year-old model, and reality TV star, had an argument before the athlete fired the shots that killed her. 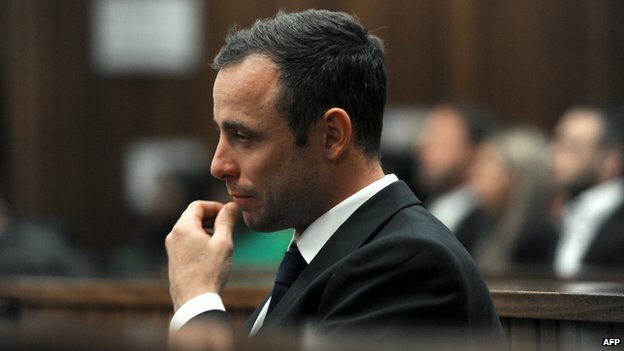 If found guilty, the 27-year-old, a national sporting hero dubbed the "blade runner", could face life imprisonment.